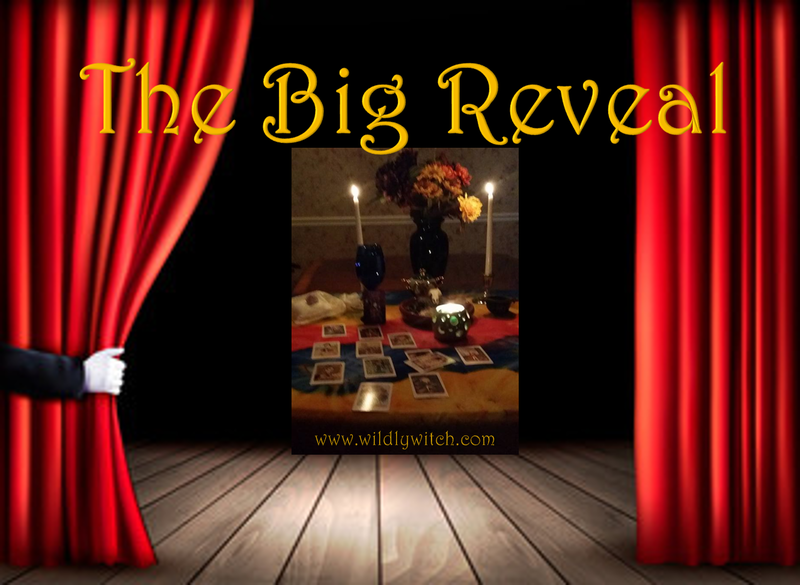 It's time for our Tarot Tuesday Big Reveal! If you missed it, please go to the Facebook page and choose your card. For those who have already chosen, see below for your card meaning. When the opportunity to use your best talents arises, your performance will seem like magic to those around you. When you have a set of plans and enact them to perfection, quickly accomplishing your goal, people will be shocked. Your accomplishments will seem ordinary to you, as if they should have happened without question, but others will look at what you do like it is a new form of magic. All of these circumstances summon forth The Magician card from the Tarot deck. This is the card of making things happen, being in control, getting what you want because you understand how to earn it … and impressing everyone in the process of doing what comes natural to you. In the present position, this card signals the urgency of a situation of which you must seize to take advantage. 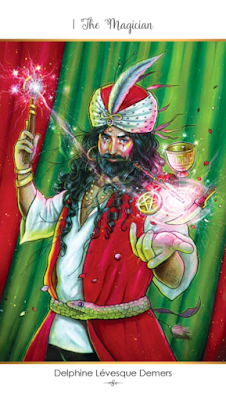 In this position, The Magician indicates that your ability to be yourself and impress the right person or people can have a big impact on the direction your life takes. The Magician in the present position is a metaphor for your free will and good luck combining in a rare opportunity to move way ahead in life. When this card is in this position, take your great leap forward. The Page of Wands is a card that blesses any tarot reading with the good fortune of youthful creativity. But how you use this blessing can be an exciting accomplishment or a total disaster. Page cards in the present position represent you starting life over again. The Page of Wands shows you with a new idea of taking control over your own destiny. 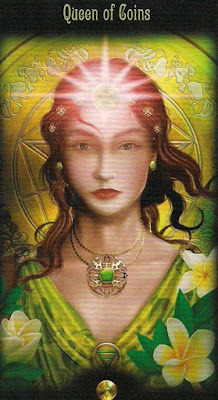 It is a powerful card in the present position, a clean slate with momentum in your favor. 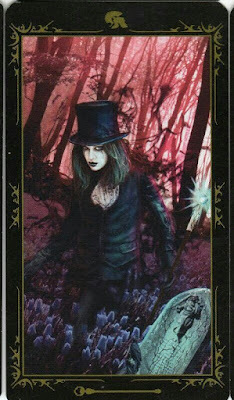 In general, this card indicates that things that you started some time ago are starting to come to fruition. It can also show a need for new things - new adventures, new approaches, and new ideas. The Page brings us beneficial energy. We must supply the follow-through. This can be a very creative time for you, and a good time for you to actually become childlike. Dream, play, be inventive. You never know what your creations during this time might come to. When it is time to "cut through the B.S.," one card in the Tarot deck will do the cutting for you: The Ace of Swords. This is the card that appears when communication is in need of being clarified. This is a nice way of saying that when someone is giving you a snow job about something, the Ace of Swords is with you to cut those words to shreds and find the clear meaning of them. The Ace of Swords delivers the reality of the situation to you. This is not always easy to accept, as often it is you who have been lying to yourself, denying the truth about a relationship or other intense situation in your life. This card perseveres in a quest for what is real, but your idea of what that reality might actually be is not guaranteed. In the present position, you are clarifying an absolute in your life under which you have been serving. Perhaps you sought a Tarot reading specifically to find a better way to describe what is going on in your life. 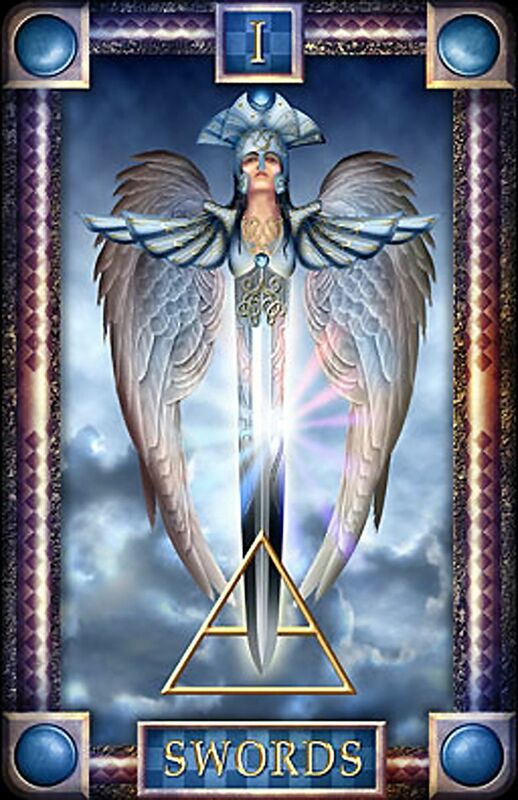 The Ace of Swords is especially empowering in this position because you are able to confront vagaries and inaccuracies in your life that are not adding up. The Ace of Swords gives you the strength to confront situations that do not mesh with your understanding of things and the presence of mind to articulate your position. When you have been nurtured into a place of happiness or are bettering a person, yourself or a situation, expect the Queen of Pentacles to appear in your Tarot reading. But does this card represent you, your potential, or someone who appears at some point during the magical journey known as your life? In the present position, the Queen of Pentacles signals that you are either enjoying a time now of being taken care of or are happily taking care of someone. The card's presence again demands that you assess your situation to receive the message – is this Queen someone who is currently making your life a little easier and providing for you or are you the person making sure that someone special is being nurtured. This card can indicate that you will be spending time, money, and energy on your home, getting it to be more comfortable. This is a good thing, provided you don't take on too much debt. People will be looking to you for insight and/or advice. You will be able to help them, if you are so inclined. This is a time period when you can get a lot accomplished. How did you do? What insights have you received today? Please share your thoughts here in comments or on the Facebook page. What else can I do to help you? I look forward to hearing from you!